Calgary, Alberta Canada – July 12, 2018 - Liz Atkins of Benchmark Stables in Hampshire, Illinois, just returned from her first trip to the world renowned Spruce Meadows Tournaments in Calgary, Alberta Canada. 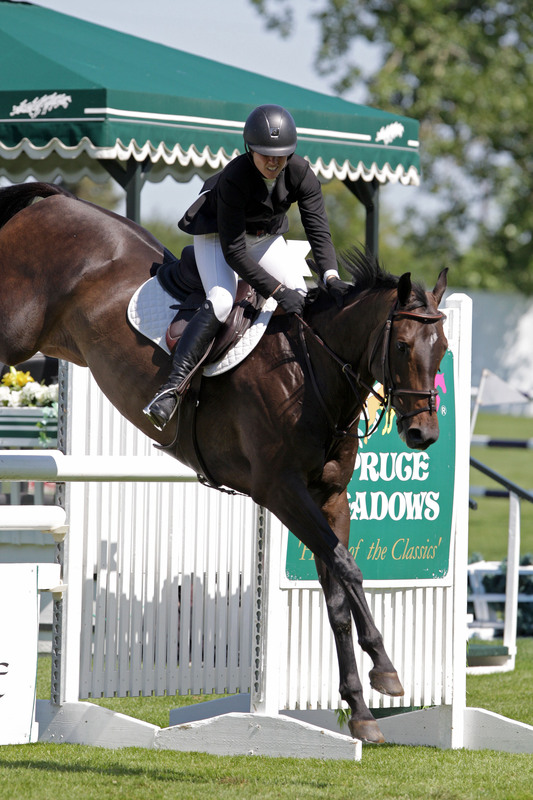 After packing up her two best horses, she navigated her way across the boarder to take in the outstanding competition experience as only Spruce Meadows can offer. Atkins was pleased with her horses there with Rodeo VDL (inset photo by Cansport Photo) placing fourth in the 1.30m during the Pan American Tournament and finished 6thin the Horseware Ireland Cup in the North American Tournament in the All Canada ring. Her mount, Undine, took home a 7th place ribbon in the 1.35m speed class during the North American Tournament as well.